Philippine President Rodrigo Duterte said Sunday that his militarily inferior country can't stop China's actions in contested waters, responding to a reported plan by Beijing to construct an environmental monitoring station in a disputed shoal off the northwestern Philippines. Duterte, however, warned that he would invoke a July 12 arbitration ruling that invalidated China's territorial claims in the South China Sea if the Chinese "start to tinker with the entitlement," apparently meaning when Beijing starts to tap the offshore area's resources. "We cannot stop China from doing his thing, the Americans were not able to stop it," Duterte said in a news conference at the airport in southern Davao city before flying to Myanmar. "Sir, what will I do? Declare a war against China?" he asked, without saying who he was addressing his question to. "I can, but we'll all lose our military and policemen tomorrow, and we are a destroyed nation." Duterte's remarks differed slightly from those of the Department of Foreign Affairs, which said that it was trying to verify the news reports about China's construction plans on Scarborough Shoal and that it would refrain from commenting while doing so. In the past, the Philippine government routinely filed protests or expressed its concern whenever China took aggressive actions to assert its sovereignty in contested territories, but Duterte did not mention any planned protest. The top official in Sansha City, which has administered China's island claims in the South China Sea since 2012, was quoted by the official Hainan Daily newspaper as saying that preparations were underway to build an environmental monitoring station on Scarborough Shoal. The preparatory work on Scarborough and on five other islands in the Paracel island group off Vietnam were among the government's top priorities for 2017, Sansha Communist Party Secretary Xiao Jie was quoted as saying in an interview published in the paper's Monday edition and seen online Friday in Beijing. No other details were provided. If the construction plans on Scarborough proceed, it would be China's first permanent structure in recent memory on a shoal that has been at the heart of a territorial dispute with China and would likely reignite concerns over Beijing's increasingly assertive actions to cement its claims in the crucial waterway, where an estimated $5 trillion in global trade passes each year. 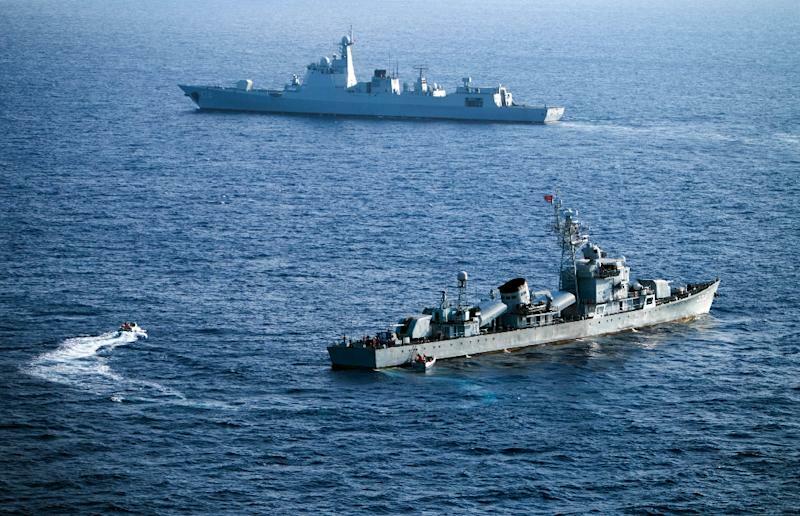 It will also be a defiance of last year's ruling by an arbitration tribunal in The Hague that invalidated China's territorial claims in the South China Sea on historical grounds. Chinese government ships took control of Scarborough in 2012 after a tense standoff with Philippine vessels. China then blocked Filipinos from fishing in the shoal, which has a vast, coral-encircled lagoon that also serves as a storm shelter for Asian fishermen. The Philippines brought its disputes with China to international arbitration the following year, but China ignored the complaint and the tribunal's ruling, which found Beijing to have violated the rights of Filipinos to fish at Scarborough. After he took office in June, Duterte put his country's territorial conflicts with China on the backburner and reached out to China in an effort to revive robust trading and seek Chinese economic aid. Contrastingly, he has lashed out at then-President Barack Obama and the U.S. government, his country's treaty ally, for raising alarm over his deadly crackdown on illegal drugs. Duterte met Chinese President Xi Jinping and other top officials in a visit to Beijing last year but did not raise the July 12 arbitration ruling. He repeated Sunday that there would be a point in his six-year term when he would do so. "When? When they shall start to tinker with entitlements," he said without elaborating. Since Duterte met with Xi, Filipinos have been allowed to fish at Scarborough and the Philippine coast guard said it has resumed patrols in the area, easing yearslong tensions in the area.